Throughout history, as far back as Greek and Roman times, books and libraries have been destroyed or seized during wars as part of the destruction or appropriation of cultural heritage. Last week, Islamist insurgents attempted to destroy priceless historic manuscripts as they retreated from Timbuktu, and in 2004 Baghdad’s National Library and Archives lost 25% of their rare books. During the siege of Sarajevo, the Serbian army destroyed the National and University Library of Bosnia Herzegovina, and the Nazis systematically confiscated cultural property, including books, as did Napoleon in the early 19th century. Earlier this year a documentary film called The Great Book Robbery brought to light a heretofore little-known part of history. 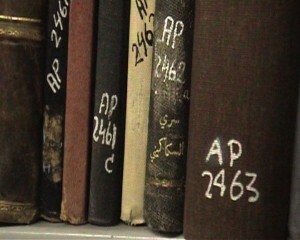 The National Library in Jerusalem houses approximately 6,000 books in Arabic marked “AP” for “Abandoned Property,” which once belonged to Palestinians who fled the country or were forced out of their homes in 1948. That year, the staff of the National Library followed in the wake of Jewish soldiers who “collected” 30,000 books in Jerusalem alone, sweeping through the city’s prosperous Arab neighborhoods. 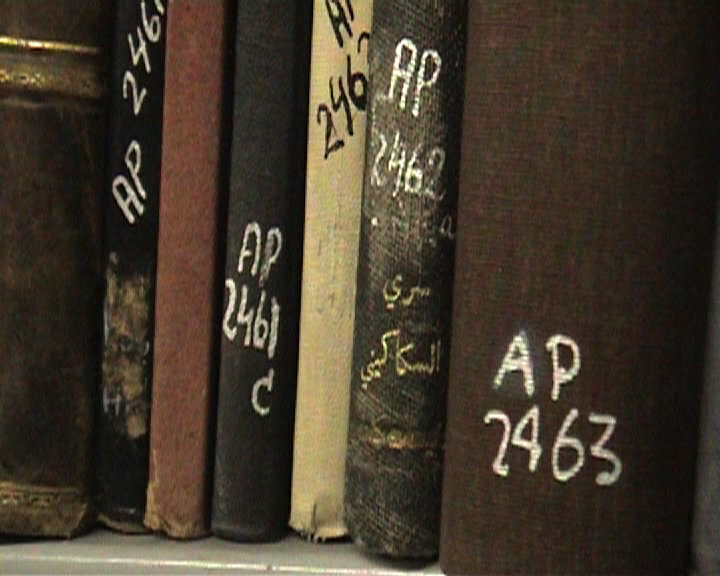 A total of 70,000 books from private Palestinian libraries around the country were taken, as shown by Israeli documents pertaining to the 1948 war. Although the film encompasses much broader issues, tracking what happened to these books is the central theme of The Great Book Robbery. The Great Book Robbery – trailer from Benny Brunner on Vimeo. “…occupation and colonization is not limited to the taking over of physical space,” writes Jewish Quarterly. Benny Brunner, the Amsterdam-based Israeli director, said it took him five years to get the film made. He took inspiration from an article he read in 2007 by a PhD student, Gish Amit. Amit had sifted through countless declassified documents including memos from Kurt Warman, director of the National Library in 1948, and Dr. Strauss, then director of the library’s Oriental Studies department, which recount how the books were appropriated. An Israeli journalist, Haim Hanegbi, recorded how Sakakini’s daughters visited the National Library after the 1967 Six Day War after hearing rumors that their father’s books were there. There, the librarian allowed them to see one book, in which their father’s handwritten notes were scribbled in the margins. In the film, Brunner interviews among others, Gish Amit, Uri Palit, a former librarian at the National Library, Aziz Shehadeh, a Palestinian lawyer who worked at the National Library cataloguing Arabic books and Nasser Nashashibi, a writer, who was told by a professor at the Hebrew University that he knew of him because the University had some of his family’s books in its library. Aziz Shehadeh suggests that if the books are returned, they should be divided between the two Palestinian universities of An Najah and Bir Zeit. “Perhaps the National Library could keep high quality photocopies…?” suggests Mahmoud Yazbak, a social historian. Brunner is doubtful, but said he hopes that the outcome of his film will be that at least the books marked “AP” will be returned to their owners. The Great Book Robbery will screen across the US this month. See the dates and times here. DISCUSS: Should Kid’s Textbooks Avoid the Israeli-Palestinian Relationship?